VANCOUVER , July 16, 2018 /CNW/ - BlueBird Battery Metals Inc. (BATT.V) (BBBMF) (the "Company" or "BlueBird") is pleased to announce that recently a cobalt bloom rock specimen collected by the Yukon Government from the Batt Co-Cu Project in the Yukon, Canada assayed 1.16% Cobalt and 0.66 g/t Gold. The Company also wishes to announce that it will commence its summer 10-day exploration program at the Batt Project in early August 2018 . 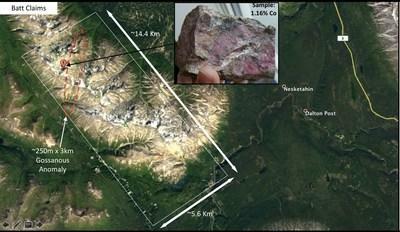 "We are excited to commence the first detailed exploration program at the Batt Co-Cu Project since the 1960s. The recent high-grade rock sample averaging 1.16% cobalt, indicates the potential of battery metals at the project, noting it also re-confirms historical grades sampled over 50 years ago," commented Chairman and CEO, Peter A. Ball . BlueBird's summer exploration program at the Batt Project will be comprised of property-scale mapping, soil and rock chip sampling, and a general reconnaissance exercise to evaluate the mineralized trend that has been identified across the claims. Multiple cobalt blooms occurences have been identified, with the one sample tested yielding the high grade cobalt result. Information gathered from the program will assist the Company in planning a potential larger exploration program, which may include ground EM or aeromag geophysical surveys, in the fall of 2018. The program will be completed by the technical team from Strategic Metals Ltd. ("Strategic")(SMD.V). BlueBird entered into an option agreement in March 2018 with Strategic to acquire an 80% interest in the Batt Claims in the Yukon Territory , Canada. "We have asked our exploration team to assess the possibility of a "Windy Craggy style" Copper-Cobalt VMS style deposit on the property. The Yukon Government has mapped a mafic volcanics/ sediment contact across the Batt property that may be prospective for that style of deposit," stated Alf Stewart , President of BlueBird. The Property is located 70 km south of Haines Junction , Yukon and 16 km from the Haines Road at Dalton Post. The claims cover a prominent gossanous ridge where cobalt bloom has been reported in multiple locations. The project is located approximately 20 km north of the British Columbia border, where in 1967, minor historical exploration work completed identified a zone that is steeply dipping, north trending and about 3km long and 250m wide. Two historical grab samples collected assayed: 5.6% Cu, N/A Co, 0.4% Sb, 0.7 g/t Au, and 1.7% Cu, 0.65% Co, Sb N/A, 2.7 g/t Au, where sample 2 was very similar metal ratios as Windy Craggy. Batt claims re-staked in 1993 based on geological similarities to the Windy Craggy deposit with a historical (1991) Proven and Probable Reserve of 297.0 Mt @ 1.4% Cu, 0.07% Co (source Government of British Columbia MINFILE database). The technical content of this news release has been reviewed and approved by Wes Hanson , P.Geo., a director of the Company and a Qualified Person pursuant to National Instrument 43-101. BlueBird Battery Metals (TSXV: BATT; US: BBBMF) is a Canadian publicly listed company focused on the global exploration and development of strategic battery metals projects, primarily cobalt and nickel. BlueBird's goal is to pursue a business model that offers direct and long-term leverage to the price appreciation in nickel and cobalt, two principal materials in EV batteries. The Company plans to become a leader in the battery metals sector, as cobalt is currently in a global supply deficit, has a vulnerable supply chain, and is part of an emerging sector with extraordinary potential. BlueBird is advancing its portfolio of battery metals focused assets in Western Australia and New South Wales, Australia , and in the Yukon, Canada , and is currently reviewing new acquisition opportunities to add to the Company's project portfolio. This news release may contain or refer to forward-looking information based on current expectations, including, but not limited to the Company exploring its properties in Australia or the Yukon , and the impact on the Company of these events, including the effect on the share prices. Forward-looking information is subject to significant risks and uncertainties, as actual results may differ materially from forecasted results. Forward-looking information is provided as of the date hereof and we assume no responsibility to update or revise such information to reflect new events or circumstances.